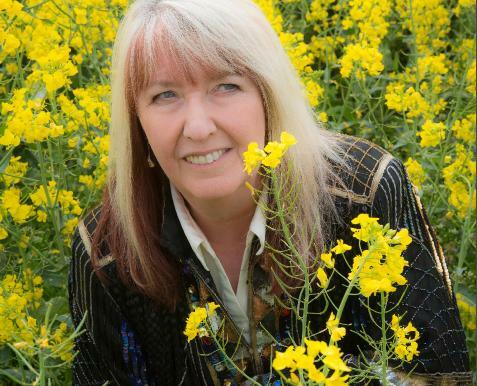 Over fifty years from her first appearances on the sixties folk scene, Maddy Prior is one of the most enduring, influential and respected artists in British music. In 1969, she and singer/guitarist, Tim Hart, joined forces with Terry and Gay Woods and Ashley Hutchings of Fairport Convention to form a band fusing folk with a more contemporary, electric sound. Taking its name, Steeleye Span, from a character in traditional Lincolnshire ballad, 'Horkstow Grange', the group took folk music from the clubs into the charts with 'Gaudete', a Christmas chart entry in 1973 and 'All Around My Hat', a no. 5 hit in 1975. Maddy has also released many solo albums and regularly performs with The Carnival Band, performing Christmas music and exploring her love of early music and hymns. In 2000, she was awarded an MBE in recognition of her long-standing contribution to folk music. Our reviewer, Nicholas John, caught up with Maddy in the wonderful confines of The Theatre, in Chipping Norton, during her October solo tour. SF: You've a new album, Shortwinger, coming out soon, featuring Giles Lewin and Hannah James, which has a central theme about nature? MP: It has, there are a lot of pieces about birds and one about hares. We're all interested in nature and we can all relate to birds. It really felt like something we wanted to look at and the album has worked out really well. MP: Not a lot! And 'The Austringer' is another one with an unusual title. It describes the relationship between a Goshawk and its handler. SF: Is the album newly written material or traditional arrangements? MP: I think we've kept that for this album as well but it's not quite as full on, if you know what I mean; it's a little more woven in this time. MP: Steeleye are on tour from mid-November till just before Christmas. The first half of the show is going to be the very first Steeleye album (1970's Hark! The Village Wait) and the second half more of the newer material from the last few albums, including 'Wintersmith' and 'Dodgy Bastards', which have more of a heavy rock feel. With a bigger band, we've got more clout! SF: Steeleye has constantly evolved and undergone many line-up changes but you've kept on releasing new music. Do you think the band has avoided falling into the nostalgia trap? MP: I like to think we have, because we don't stay still and we don't do the same things. We have such a vast repertoire, we can't just repeat the same songs all the time. And we'd have no interest in doing that anyway. The one song we always tend to do is 'All Around My Hat', for obvious reasons! SF: You've got to play that one, haven't you? MP: Well, there have been tours when we've not played it but, because we don't do the tribute band thing and we're not a tribute band to ourselves, the only song you can absolutely guarantee that everyone will know is 'Hat' – it's become our anthem hasn't it? I say to the band, 'never mind the groaning and grumbling, just play the bloody thing!' That's the way it is, that song is a big part of all our lives! SF: There's a definite folk revival happening again now, isn't there? It must help bring younger audiences to see Steeleye, and to your own solo gigs? MP: There's a massive revival going on, with young musicians who are absolutely superb and doing really interesting things. Hannah is one of them. She's a brilliant songwriter and interpreter of traditional song. For me, it's all about the material, that's what's important. I always think we're the vehicle for the songs. Some of them are really dark, they dig into dark places, but they're always fascinating. Singing about profound things is a great way to examine them. SF: And there's no time this year for a Carnival Band tour? MP: Not this year, we'll be out next year. I do every other year with The Carnival Band, but they do their own gigs anyway, sometimes bringing choirs in, which is really nice. MP: Of course, as in any walk of life, there are always moments when you think, 'I wish I was doing something else'. Everybody does. But that's not usually when I'm on stage, it's usually when I'm in the bloody van! There are bits of touring that can be tedious, but the gigs are always great!